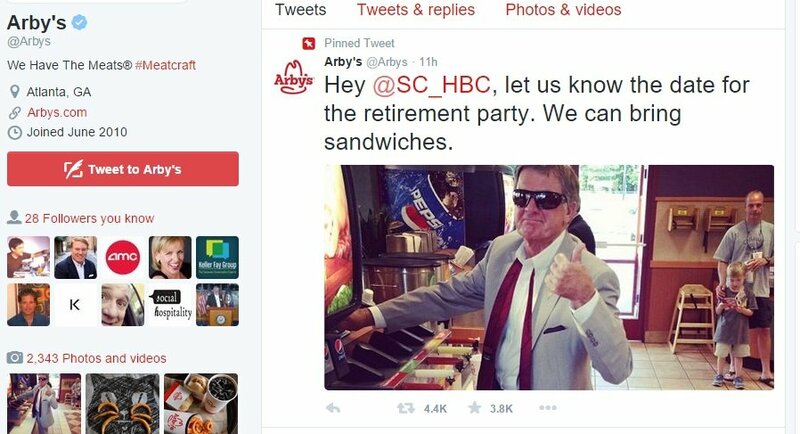 Kudos to Arby’s social media team for taking advantage of the Steve Spurrier retirement story that br oke yesterday. With 4.4K retweets and 3.8K favorites (as of this moment, anyway), it’s clear the Arby’s Twitter Team was listening to its customers’ conversations yesterday. By hopping in with a brand-focused, news-cycle-savvy tweet, they’ve hit this wave at the right moment. Up to this point, the Arby’s Twitter feed has been a lot of push about their product — light, fun, easy to share. But not a lot of focus on what’s going on in the lives of their customers (beyond eating meat). Here’s hoping they can take full advantage of this moment – and continue to find ways to mirror customers’ (and potential customers’) passions in their social media interactions.